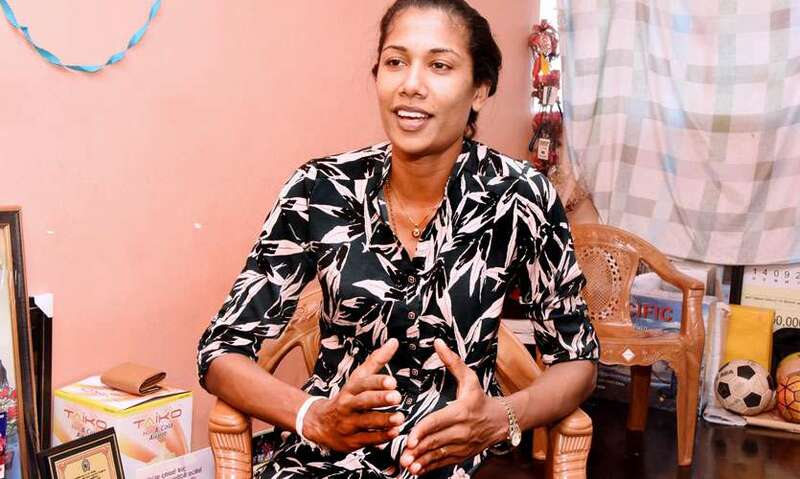 Chathurangi Jayasuriya, the captain of the national netball team has been a dedicated player who was determined to bring the trophy back to the country. Currently working as a flight lieutenant at the Sri Lanka Air Force, she is a proud product of Sri Dharmaloka College. Having started her sports career as an athlete who excelled in high jump, long jump and triple jump events, she had a passion for sports since her childhood. Although she played netball as a hobby she was interested to join the pool after our girls won the Asian Championship in 2009. To date, she is still passionate about her favourite sport and wishes to take it to greater heights. Q: How did you get involved with netball? A: I played netball at school as a hobby and in 2009 after our girls won the Asian Championship they called in for interested girls to join the pool. 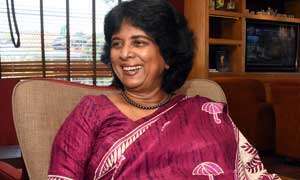 After I saw the paper advertisement I found an interest in it and I started to practice under Ms. Trixie Nanayakkara. She trained me for the Youth Asian Championship which was held in 2010 but I didn’t have a team. So she got me into a team and I faced the championship. At that point, I got job offers from Sri Lanka Army, Air Force and Hatton National Bank. I was waiting for results and I was determined to get university entrance. I was accepted by the Sri Lanka Army because I got good results but the same opportunity wasn’t given by the bank. However, I opted to join the Air Force because I was able to get a degree in aviation and eventually got a permanent job there. Q: Are you satisfied with the journey you have come thus far? A: The Air Force has given me the freedom to attend practices and matches and in that way, they have supported me a lot. Although I’m a national netball player I live on the salary I get from the Air Force. But I’m grateful to them for releasing me from my duties along with four other players giving us the opportunity to concentrate on the championship. When we didn’t have a court to practice the Air Force commander got involved to give us a place to practice. I got selected for the Netball World Cup tournament in 2015 but I faced many challenges during that time. Even though I went there it was quite an unpleasant experience for me. I wanted to give up the sport but when I found out that Ms. Thilaka was going to train us I decided to move forward and I eventually became the captain. So I’m happy and humbly proud that I was able to bring back the trophy back to my country amidst all the challenges. Q : In the run-up to the championship how did everybody prepare as a team? A : We focused on our strengths. The entire team, my family and my husband have been there for me through thick and thin. I also like to thank Nalaka Hewamadduma who conducted mental skills development training to mentally prepare us for the championship. I appreciate the fact that he came in as a resource person and when we were about to face the tournament he gave us the moral support which motivated us to face the game with confidence. Q: How did you feel when you got into the semi-finals? A: That was the most stressful part because we had to win it to reach the finals and get qualified to the World Championship next year. We already defeated the Singapore team thrice this year. We have beaten them even during times when the team wasn’t prepared at all. So we knew that we had a chance and we were prepared to fight with them. We had to face the Hong Kong team which we faced the previous day. I have committed 100% towards practices. Even for athletics, it was the same. So I believe that it is only if you commit 100% you will win. On the other hand, Ms. Thilaka is very strict and with her, we have to do a full two-hour practice session and she wants everybody to catch up with the speed of the fastest player in the team. Q : What is most satisfying about your career? A : When I gave up athletics and stepped in to netball everybody said that I would have a better future in athletics. But netball is my passion and I’m happy that I was able to be the captain this time and bring the trophy back to the country. In fact it was the best achievement in this career. A : We didn’t have a court to practice until the Air Force commander intervened and gave us permission to use the indoor court. Although we had an indoor court it was far away and we had issues with sorting out transport and other logistics. Practices began at 6.00am and I didn’t have a bus to travel from Kiribathgoda to Colombo. Then I was asked to stay at the hostel but the hostel environment isn’t suitable for a player either. We don’t get a good pay and when we allocate money for other activities we are short of money. Some players have sick parents, they want to apply for loans etc. but the pay wasn’t sufficient. We didn’t have sponsors either. We didn’t get the cash necessary to allocate for the nutrition package which we were supposed to get from the government. It is not only about playing but I have to coordinate with the administration and ensure that I provide a good environment for the players to perform. Hence all responsible authorities should get together and ensure that the players’ future is secured because the sport has a long way to go. Q: As a leader, what message would you like to give fellow women? A: We need a clear target if we want to move towards victory. So as a team everybody has to work together. In this journey, we need to identify the skills of the other person rather than complaining about the weaknesses. We need to respect everybody and you need to get into the other person’s shoes to know what he or she is going through. You also need to be a role model and fine tune your skills before looking at the weaknesses of another.